If there's any band to endure food poisoning for, it would have to be The Wombats. This year marks a decade since The Wombats' debut studio album A Guide to Love, Loss and Desperation was released. Since then the Liverpudlians have drawn in the masses all over the world with their subsequent dance-inducing records. And of course, it'd only be fitting for the trio to celebrate, alongside recent nation-wide appearances at Groovin The Moo and (the upcoming) Splendour in the Grass. And heck, I wasn't about to miss them. 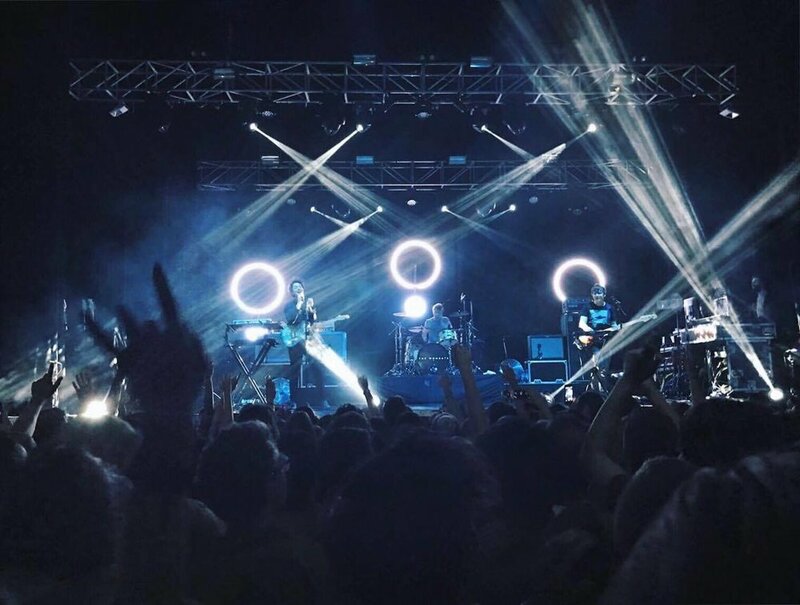 Fortunate for us, Perth has had the pleasure of welcoming back The Wombats yet again. Two years ago saw the well-established band play their hearts out at Metro City, and this was no doubt one hell of a sequel. Ah, Metro City yet again. Tucked away in the bosom of Northbridge, Metro City is no doubt one of Perth's bigger and more unsuspecting venues. And as I had always wondered why artists kept coming back to perform here, I'd found my answer halfway through the gig. From desperately trudging up and down flights of stairs, to only being able to catch a sliver of the stage at times, it all started to make sense. Metro City is a little archaic-looking, and reminiscent of an early 2000s era nightclub to say the least, but it's highly distinctive of Perth. Think snug, commonplace, and perfectly equable. Opening act Verge Collection, however, were quick to change this. In stark contrast to the melodic debauchery promised by the main act, Verge Collection were a standout. The Perthies' brand of alternative garage-folk was simply undismissable, and deserving of their place as support. With fiery, feel-good tunes, Wombats lovers were only just getting warmed up. It wouldn't be an over-exaggeration to say that the epitome of The Wombats lasted for as long as they'd made their entrance, right to when they'd leaped right off stage. The band kicked off with circa 2007 classic 'Kill The Director', followed by 'Moving To New York' and 'Lost In The Post'. Many other masterpieces — including '1996', 'Jump Into The Fog' and 'Your Body Is A Weapon', to more recent tracks off Glitterbug ('Give Me A Try', 'Greek Tragedy', and 'Emoticons', to name a few) were lined up in their repertoire. And what a truly vibrant night it was; The Wombats were larger than life with a boundless capacity to entertain, and this showed as they filled the venue to the very brim. All the stunning tracks handpicked for the night were each given their due attention, as a rightful labour of love. With a few experimental effect pedal intros, the trio churned out eccentric verses one after the other to an equally receptive audience. They imparted an unmatchable sense of grandeur to the venue — so much so that I may have even forgot I'd stepped foot in Metro City. To the rest of us, we didn't care, as we were there for a singular worthy cause: the boys themselves, who constantly outdid themselves. Minor curveballs such as these did little to dampen The Wombats' spirits; they were undeterred, and refused to let anything come in the way of an animated evening. Having been well into the chorus of 'Emoticons', Matthew Murphy had no choice but to stop and apologise for feeling the electricity coursing through his veins — to our delight, however, 'Tokyo (Vampires & Wolves)' was picked up in quick succession, which allowed the former song to be later resumed. To tie in the night, the boys finished their set with their infamous anthem 'Let's Dance to Joy Division', which sent even reluctant foot-tappers and die-hard techno fans into a frenzy. It was the joys of explosive new-age disco at its finest. Yet the ease in which I basked in throughout the night was enough to convince me of one thing: nothing comes quite as close to being within near proximity of the sweet, sweet crooning of the Murph. Despite the packed space, The Wombats had effectively lulled the crowd into an idyllic but cathartic state. Soon, it was all too comfortable, and we were all truly right at home. As we shuffled out of the venue and out into open air, with my stomach still in knots, a revelation withstood: this was not a party, but a hurricane.